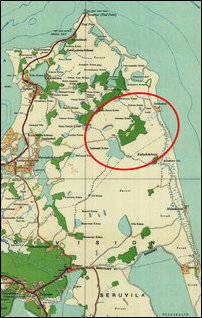 Occupying Colombo is seizing the coastal lands with the plan of creating new pockets of Sinhala-dominated settlements, where each cluster would consist of 50 houses dotting the coastal stretch to the south of Moothoor East, informed civil sources in Trincomalee said. The SL Forest Department was seen putting border-stones demarcating the former settlement of Tamil-speaking Veddahs on Tuesday. The Forest Department guards were continuing the work also on Wednesday. The SL Navy and the Forest Department have been blocking the people not to clear the forested lands. The people have also been reluctant to enter the lands fearing harassments from the SL Navy. In 2017, the grassroots activists in Moothoor East managed to postpone the project of the Forest Department to plant new borderstones. The activists urged the SL Forest Department to wait until the people managed to secure the papers to document their ownership. Tamil politicians have also failed to defend the land rights of the ancient people. The term of the democratically elected Eastern Provincial Council also expired in September 2017. In 2017, there was a Tamil official in the Forest Department. However, now a Sinhala official is appointed, and the SL Forest Department is accelerating the process of planting border stones. Ilakkanthai will be colonised in future in the same pattern as in the bordering Seruvila division in the south. The Tamil coastal stretch of Uppoo'ral, which is absorbed into the Seruvila division in the south is already subjected to Sinhalicisation. 28.07.18 Maithiripala ‘coordinates’ relentless land grab at..
07.07.18 SL Police in Champoor blocks remembrance of Tamils..